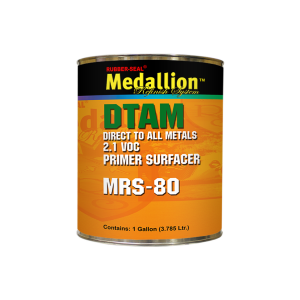 DTAM is a two-component primer surfacer that has excellent adhesion to cold-rolled steel, aluminum, galvanized panels, galvaneal, body filler, fiberglass, SMC and OEM finishes. It has excellent anti-corrosion properties and sands easily without loading the sandpaper. DTAM Primer Surfacer eliminates the need for pre-treatment primer. It mixes 4:1 with MRS-82 DTAM Activator. It is available Gray and Black. Packaged in quarts and gallons.